Hills, hills, so many hills. Last time we flew to Hong Kong lives in our memories as a nightmare. The flight was so ugly we didn’t get to leave the airport. By comparison this time was heaven with not the slightest incident to report. Upon landing we caught the train into the city and then a mini-bus to our apartment. Just over an hour after picking up our bags we were ensconced on the 30th floor of a new apartment block on the mid-levels. A quick dash to the supermarket and dinner was cooking and all was well in the world. After a lazy start to the day we set out to explore. Now in case you have not been to Hong Kong before it’s all about hills. The fact we are staying in the mid-levels is a bit of a hint; but it’s not until you start exploring on foot you realise there are steps everywhere and the streets meander up and down constantly. Add in some serious humidity and we were bedraggled in short order. The first part of our plan was simple. Wander around the streets vaguely heading for the Star Ferry wharf. 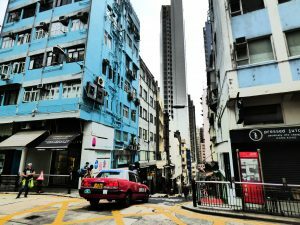 It’s remarkable how much Hong Kong is like a dystopian science fiction movie with towering, shiny skyscrapers looming over a rabbit-warren of little lanes filled with tiny shops and stalls selling all manner of food and things. The hills and the duality of skyscrapers and lanes make this a very vertical city. Jennifer and Cal on the ferry. The thing that wasn’t vertical were the little cardboard fortresses laid out in the pathways around the train station and wharves and housing hundreds of Philippina maids socialising on their day off. Each little group seems to use cardboard boxes to create a combination of picnic mat and fence marking out their own area and then they sit in public privacy eating, chatting, and exchanging gossip. The Star Ferry over to Kowloon-side feels like it is held together with thick layers of paint and if you were to peel back the layers and count you’d get some fabulous total for its age. Jostling about on the Harbour with rusty barges, container ships, and the occasional junk has a very exotic feel to it even for the short trip over the Kowloon. 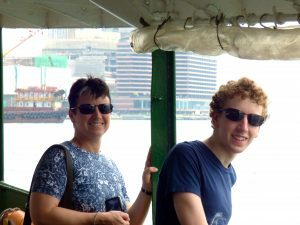 And, for today, the ferry trip was all we were trying to do – exploring Kowloon is for tomorrow. So after a brief stroll about we got the ferry back, paying extra for the top floor. Back in Central we took the escalators up the hills. The Central to mid-levels escalator system is the longest outdoor escalator system in the World, stretching for over 800-metres and rising 135-metres through the streets. It’s not a single escalator, but a series, which disappointed us a bit, but makes perfect practical sense. 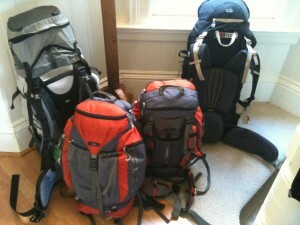 And it’s great way to get up the hills. Unfortunately we hadn’t paid enough attention to the route from the escalator to the Peak Tram which was our next destination. It’s a hot and hilly walk which left us with few reserves for what faced us when we got to the Peak Tram – a queue over well over and hour-and-a-half long. It took us all of a micro-second to agree that that was a non-starter. The second non-starter, though, was finding anywhere to sit down and re-group – Easter Sunday isn’t the best time to find an open cafe or anything. We wandered through the nearby Hong Kong Park – climbed a viewing tower in a fit of madness – and saw some great turtles or tortoises on the way to coming up dry on the food and drink front. At that point discretion became the better part of valour and we caught a mini-bus back to our apartment and turned on the aircon. Tonight we’re having dinner with some local friends, so a rest is in order. Many maids in cardboard forts. The good ship Twinkling Star.